Motherwell manager Stuart McCall bemoaned a lack of confidence in his side following the 1-0 home defeat by St Johnstone. 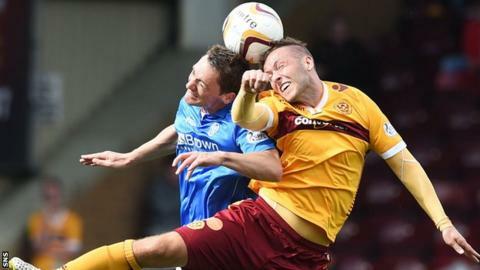 The Steelmen remain third-bottom of the Scottish Premiership table after four straight defeats, having won their opening fixture. "It was a struggle," McCall told BBC Scotland. "Sometimes you just need a result to build a bit of confidence. "We've just got to keep working hard and it'll turn, we know that. Substitute Brian Graham headed a late winner for Saints after Motherwell had had several chances to go ahead. "I certainly think with the second-half performance we didn't deserve to lose the game but that's the way it's going for us as the moment," said McCall. "They've had some good efforts, they've blocked some of our efforts with good defending by them - we've had one kicked off the line. "I think a point today would've been deserved. It would still have been a struggle. We wouldn't have been happy, we would've been satisfied." Zaine Francis-Angol, who is still short of match fitness, was replaced by Simon Ramsden shortly before the St Johnstone goal with the substitute deployed in an unfamiliar left-back role. "We've got caught late on and we're trying to put square pegs in round holes," explained McCall. "We knew Francis-Angol would only probably last an hour and we're just trying to patch things up at the minute. "When you're struggling with injuries and then you're getting players who are not playing at their best, it all goes into the melting pot." And McCall revealed he is unlikely to be able to strengthen his squad before Monday's transfer deadline. "We can't bring any more people in, if anything we have to probably get people out," added the 50-year-old.